Two different events awakened my curiosity concerning postmarks. The first was a 1935 four-bar handstamped cancellation of the U.S.S. Panay. The movie Sand Pebbles had a connection to the cover and has its basis in history. The Panay and its history are available on the Internet. My wife and I vacationed in the western part of the country one year and were in the vicinity of many locations that involved the Lewis and Clark expedition as well as the overland routes of the westward movement of 1840s to the 1870 period. I collected many pamphlets and brochures about the various places and used them as reference points for research. Using the Internet, I was able to read the actual diaries of Lewis and Clark as well as many diaries of later pioneers. These diaries were used to pinpoint locations that are now communities. From there the purchase and creation of postmarks became a manageable task. Every stamp, postmark and cover has some historical meaning whether for the individual receiving the item or in the larger context of a country's progress and development. 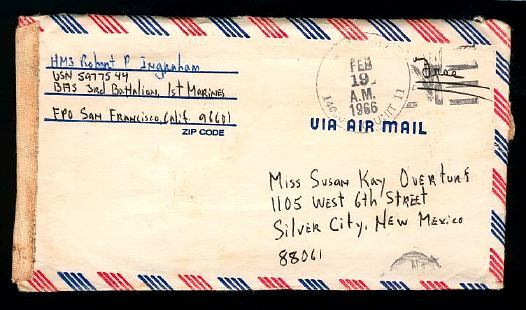 War time mail received by families at home in some way charted the progress of the son or daughter who was in the armed services during World War Two, Korea, Viet Nam and in Desert Storm. In this context, the mail item, stamp or free franking, postmark and cover would seem to have a very personal meaning for the family receiving such an item. Love letters, letters from children at school and/or camp and other personal correspondence take on a very personal meaning. Many of these types of covers are readily available from stamp and cover dealers. from Viet Nam to his fiancee, Susan Overturf, in 1966. Postmarks, covers, certain stamps, and pictorial cancellations provide us with the history of the progress and development of our country and heritage. As a history buff, I became intrigued with cover, postmark and pictorial cancellation collecting as a result of finding the postmark “tubafore”* of the U.S.S. Panay pictured at the beginning of this article. The Panay was part of the "Gunboat Diplomacy" policy in China prior to World War Two. The movie Sand Pebbles approximates the story of the China Sailors and Marines during this period. 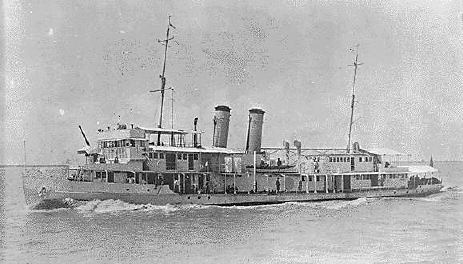 The Japanese in China "accidentally" sank the Panay sometime during 1937. This postmark, in a small way, becomes part of the larger part of twentieth century history. Prior to the Lewis and Clark Corps of Discovery in 1804-1806, very few settlers had been west of St. Louis. The territory was populated by Native Americans, and had been explored by a handful of trappers and hunters. In fact, there was very little exploring between the 1500s and the early 1800s; few permanent settlements were established. The Lewis and Clark Expedition from St. Louis to Fort Clatsop in Oregon is documented in the daily diaries these men maintained. Many if not all of the cities established along their route are a tribute to the entrepreneurship of President Jefferson and Lewis and Clark. Many covers are available to collectors from these cities and with the help of the Internet and modern public libraries, the histories of the region, as well as the communities, help to make a fine album presentation. The diaries and letters of the settlers and explorers, who traveled and settled this country, make the history come alive. They tell a story of the daily trials and triumphs. Reading these diaries and letters is almost as if you are having a personal conversation with the writer. These diaries and letters are today's telephone conversations only they happened as far back as three or four hundred years ago. These letters and diaries also are the backbone of many historical novels that somewhat explain the daily lives of the time period. Pictorial cancellations that are available through the United States Postal Service are another direction for collecting with a historical perspective. 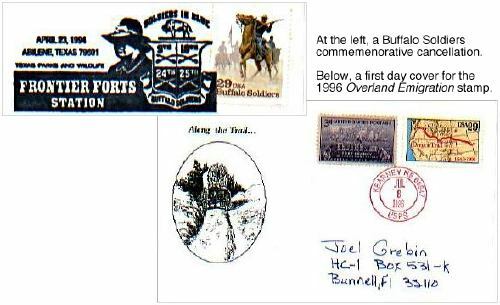 Several years ago, many western communities developed pictorial cancellations in conjunction with the issuance of the of the Buffalo Soldiers commemorative stamp. The cancellations commemorated the forts, towns and cities that directly benefited from these horse soldiers and their efforts to protect the settlers. The Buffalo Soldiers, cavalry units made up for the most part of African American soldiers who had served in the Union Army during the American Civil War, went on to serve the country through all of the conflicts of the late 19th century and 20th century until the unit was finally disbanded after the Korean Conflict. The Overland Emigration stamp provides the starting point of great research and discovery for U.S. collectors. The opening of the west begins with the Overland Emigration. It is not one trail, but ten or more trails. They all start in or near St. Louis about 1839 and continue to about the time the Transcontinental Railroad was completed. Historians approximate that 500,000 people attempted this crossing. These people went to California, Oregon, Utah, Montana and many of the other western states to settle and start a new life. They wrote letters home and they wrote diaries. Many incidents with native Americans were documented. There is a wealth of information available to read and study and use in a collection of covers, pictorial cancellations and postmarks. * A "Tubafor" is the part of the cover that includes the stamp and its cancellation. Usually it measures about 2X4 inches (5X10 centimetres), but may be trimmed to the taste of the collector. Europeans call this type of material "letterpieces". Postmark collectors have traded and sold postmarks cut like this for decades. There are other ways of collecting postmarks — the whole cover, the front half of the cover (seriously frowned on by most collectors), small cuts and round cuts.